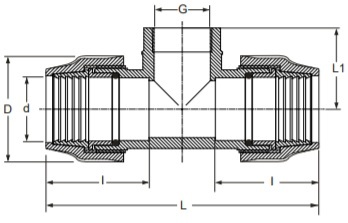 This female thread tee fitting connects two lengths of MDPE pipe and a male threaded fitting, whilst providing strong and secure joints all round. To maintain rigid and reliable joint connections, it is highly advised that pipe liners (also known as stiffeners or inserts) are also used. MDPE Tee Female Threaded 20mm x 1/2"
MDPE Tee Female Threaded 20mm x 3/4"
MDPE Tee Female Threaded 25mm x 1/2"
MDPE Tee Female Threaded 25mm x 3/4"
MDPE Tee Female Threaded 25mm x 1"
MDPE Tee Female Threaded 32mm x 3/4"
MDPE Tee Female Threaded 32mm x 1"
MDPE Tee Female Threaded 40mm x 1"
MDPE Tee Female Threaded 40mm x 1 1/4"
MDPE Tee Female Threaded 40mm x 1 1/2"
MDPE Tee Female Threaded 50mm x 1 1/4"
MDPE Tee Female Threaded 50mm x 1 1/2"
MDPE Tee Female Threaded 63mm x 2"
MDPE Tee Female Threaded 75mm x 2"
MDPE Tee Female Threaded 75mm x 2 1/2"
MDPE Tee Female Threaded 90mm x 3"
MDPE Tee Female Threaded 110mm x 3"
MDPE Tee Female Threaded 110mm x 4"